Do you have a mincemeat pie fan in your household? When I first met Tom, I had never even heard of mincemeat pie, let alone tasted one. But it is a family tradition handed down on his dad’s side of the family who are English, so every Thanksgiving we would pick up a mincemeat pie. Tom’s mom was in charge of the hard sauce (butter, powdered sugar and bourbon); and Tom would eat one slice of that pie, and we would eventually toss the rest. No one had any interest in that pie except Tom. I didn’t even know what mincemeat was… for some reason in the back of my mind, I thought it had actual meat in it, probably venison (and traditional mincemeat does have meat or suet in it). I hope you don’t get the impression I am not an adventurous eater, I am! In fact, nowadays there is rarely anything we won’t try … recently, we ate haggis on our trip to Scotland. In any event, eventually, I took a teeny tiny taste of the pie and yum, not bad. What’s not to like about dried fruit, spices and sugar? Lots and lots of sugar. No wonder Tom only eats one piece. Of course, with that new “Expando Belt” he can eat the entire thing! Last year Tom attended an event at Melissa’s Produce featuring Dorie Greenspan where he scored her new cookie book, Dorie’s Cookies. There was a recipe in the cookbook for Raisin Bars, but in the side bar, there was a note for making Mincemeat-Oatmeal Bars. 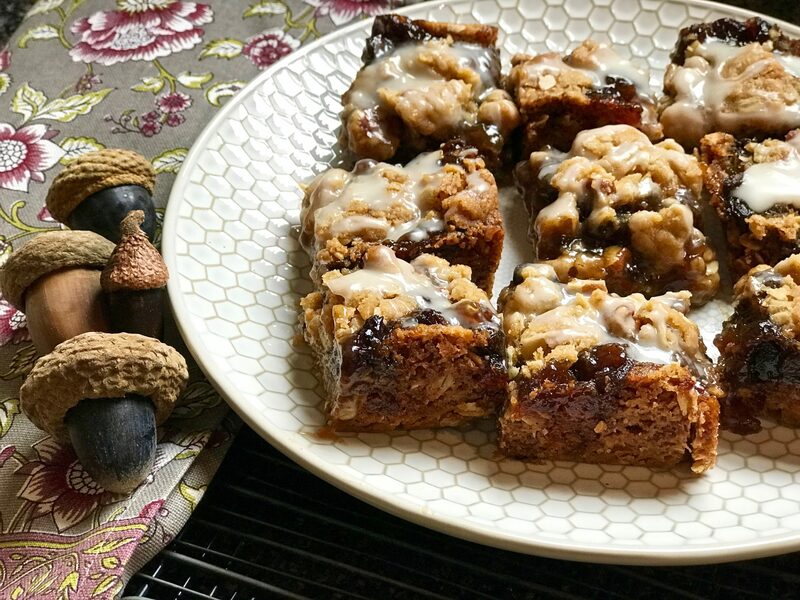 This year, ahead of Thanksgiving, I decided to try Dorie’s recipe for Mincemeat-Oatmeal Bars as they can be made ahead (my favorite) and stored in the freezer for up to two months so we won’t have to toss a pie away. Of course, me being me, I tossed in some orange zest and topped the cookies with that really terrific Bourbon Glaze from the Caramelized Bacon & Apple Coffeecake I made a few weeks ago. BTW, these bars are definitely easier to cut and eat when chilled, otherwise a tad messy. 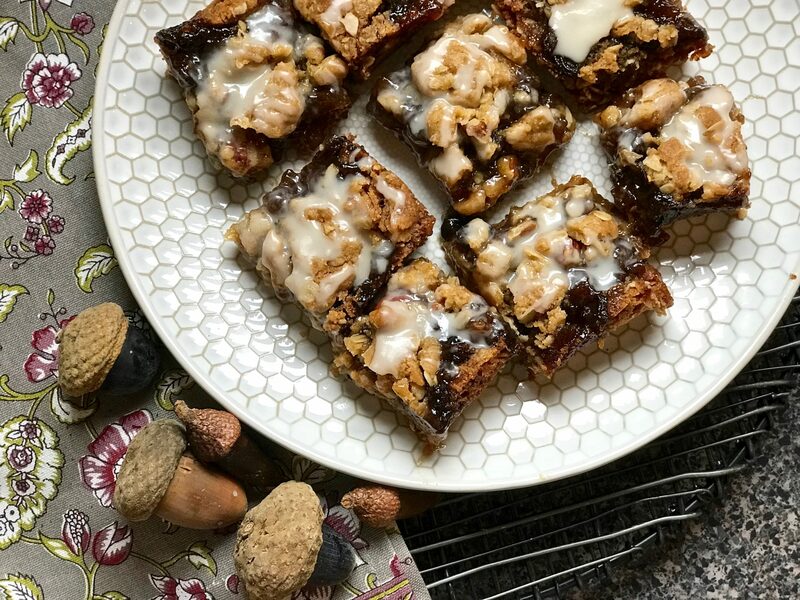 If you haven’t tried mincemeat, and especially if you have any Harry Potter fans in your family (Mrs. Weasley included mince pies in Harry’s Christmas package), give these bar cookies a whirl. You might surprise yourself and like them! Place rack in the center of the oven and preheat to 350°F. Butter a 9-inch square baking pan (or spray with baking spray). 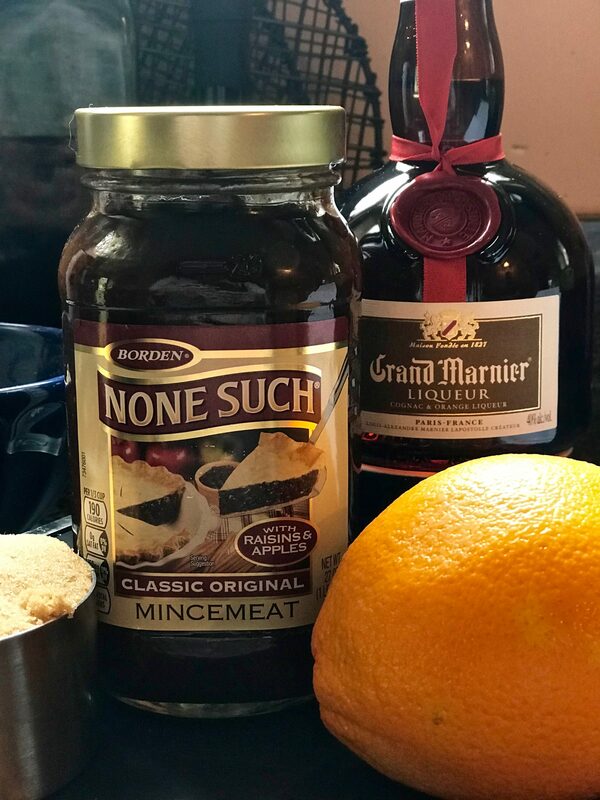 Combine mincemeat filling, Grand Marnier and orange zest in a small bowl and set aside. In a small bowl, whisk flour and baking soda together. In a large bowl with a hand mixer, cream the butter, brown sugar and salt on medium speed until smooth, about 2 minutes. Beat in the vanilla. Add the flour mixture all at once and mix on low speed until flour is almost incorporated. 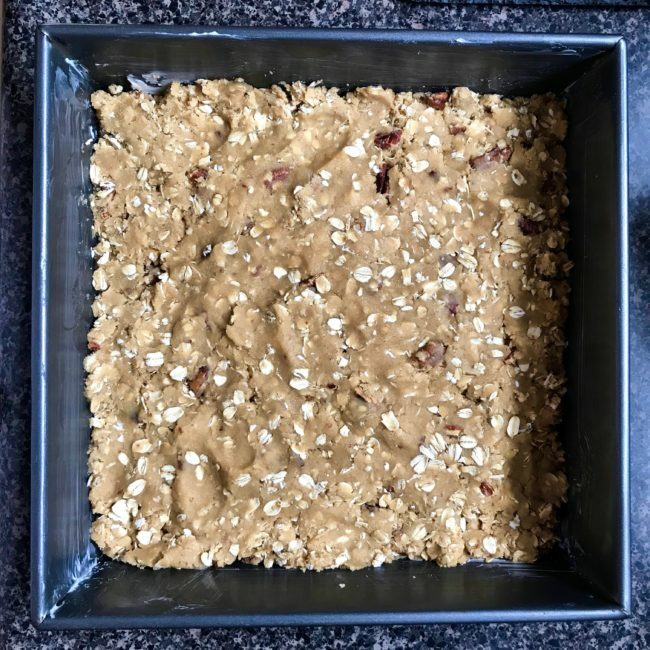 Stir in the oats and nuts and mix until the flour disappears and the dough is moist. With your fingers, press two-thirds of the dough evenly into the prepared pan. 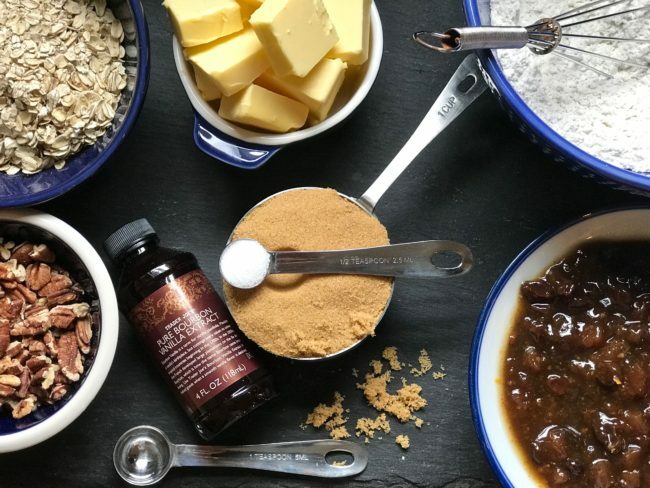 Spoon mincemeat filling over the dough, smoothing it down with a spoon or small spatula. Break off pieces of the remaining dough and scatter over the filling as a crumble. Press very gently into the top of the filling. To make the glaze: Combine powdered sugar, cream and bourbon in a small mixing bowl and whisk until smooth. Once the cookies have cooled, using a spoon, drizzle the glaze back and forth over the bars. Let glaze set for about 30 minutes before cutting the bars. If you do decide to freeze them, don’t put the glaze on until serving. Note from Dorie: The dough can be refrigerated, covered, for up to 2 days. The cookies keep nicely at room temperature for 1 day and up to 5 days, wrapped well, in the refrigerator (they’re nice straight from the refrigerator). For longer storage, wrap them airtight and freeze for up to 2 months. 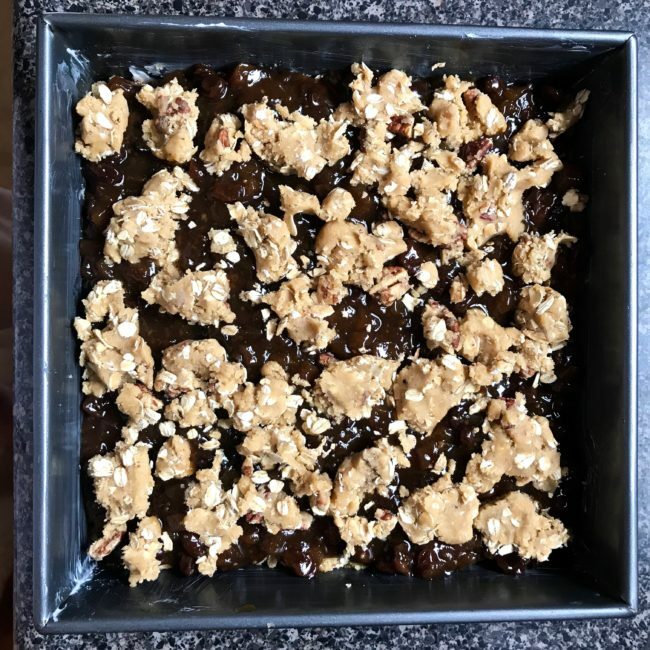 This recipe makes 24 bars. 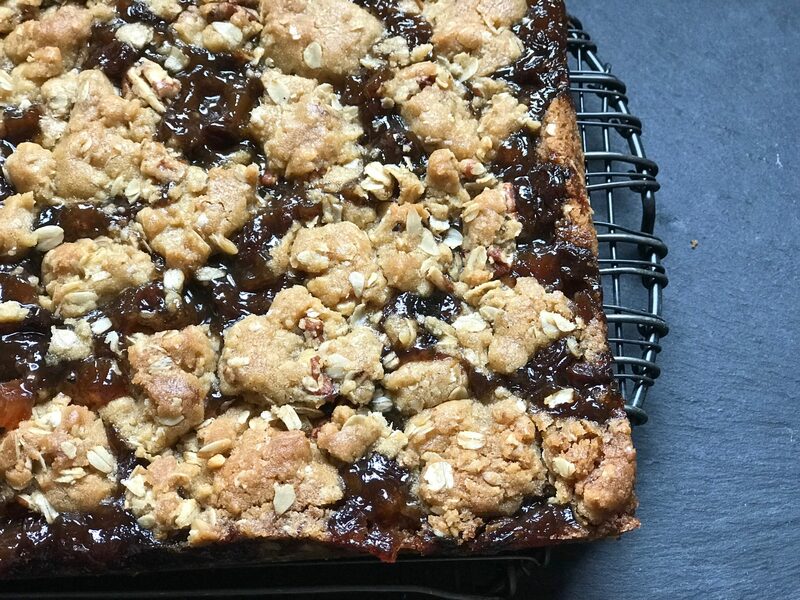 Mincemeat-Oatmeal Bars, Dorie’s Cookies.